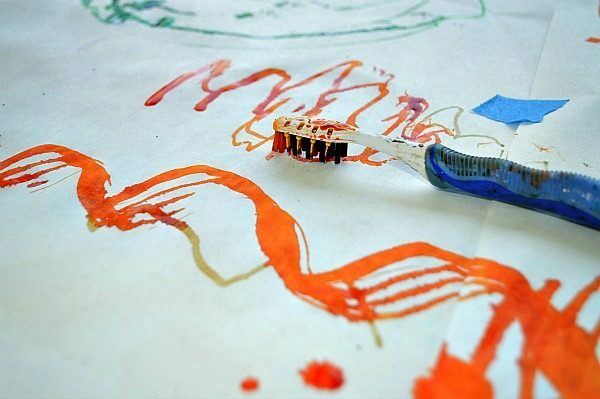 Art activities: motorized toothbrush art. 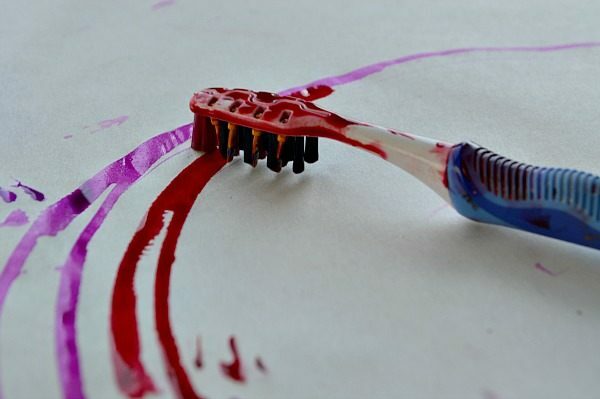 If you try this art activity, you will witness some tricks an electronic toothbrush can do – the way it can paint. Yes, toothbrush painting done by a toothbrush. Continuing with the toothbrush art activity, we did another art project using motorized toothbrush – the battery operated one with vibrating bristles. 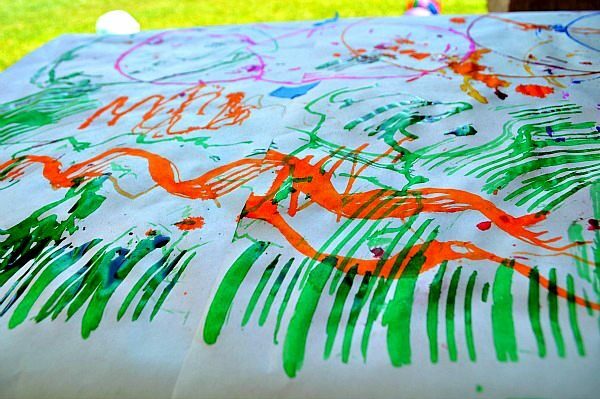 Accidents that turn into art activities are simply the best. Yesterday the spilled water on the black paper gave us a better colors. Few weeks ago the kids left a motorized toothbrush on during an art activity and that gave us an idea for another project. An idea I saved specifically for a lazy day! You know summer has been great with play dates, park, beach, ice creams and movies. After a while I burned out and wanted to take it easy at home in our backyard. But the kids are a different story, they want to do something fun and I really did not want to create elaborate art activities. I whipped out this easy project for that kind of day alone. 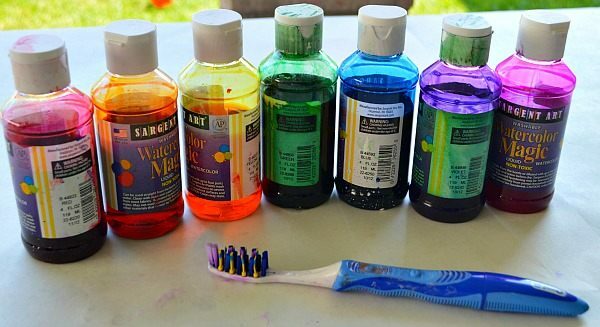 You will need only liquid water colors, a table (outdoor) and an electronic toothbrush. We used an Oral-b Pulsar toothbrush to make the little guy paint for us.. In case you are wondering we used an old pulsar toothbrush. Notes: For this to work, you need a very smooth and a flat surface. Too many layers of paper will make it harder for the brush to move. 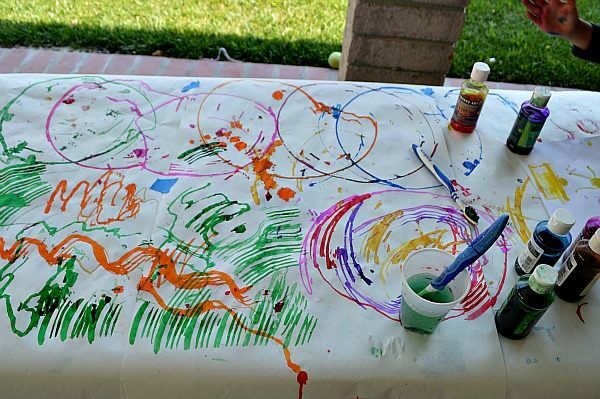 I covered my outdoor table with a sheet of butcher paper and started this fun art activity. My preschooler dipped the brush into liquid water colors and placed he brush face down on the paper and watched it in excitement. The brush vibrates and makes a nice smooth movement around the table. The brush would begin to form a semi-circle and she would slowly nudge it to form a full circle. Couple of times the brush moved around and did form a perfect circle all by itself. Here are the three beautiful circles we created. 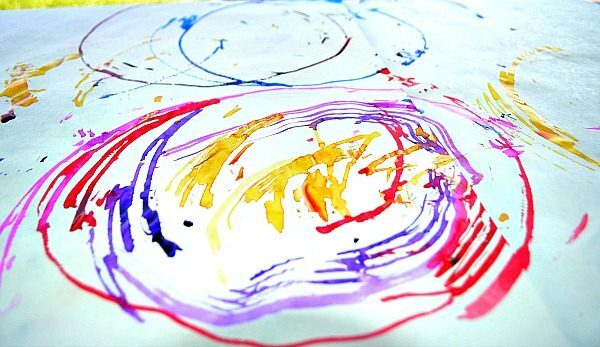 She explored with many colors and tried forming overlapping circles. It was truly FUN to watch the toothbrush move around and paint by itself. She also re dipped her brush with paint every now and then to keep the color going. You will see that the top bristles are the ones which are mostly making the marks. She got the brush to make swirly lines patterns. 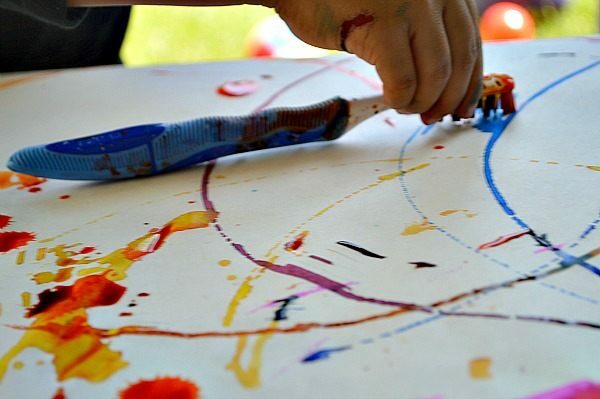 The child can be as much or as little involved in this electronic painting art activity. Of course most kids would want to be VERY much involved. It also showed my kid to make very minimal and gentle movements to get the best result. Dip with colors during the process to keep the continuity of colors. Other art activities that might interest you! My third graders study live snails. We let the snails paint. They wander all over the paper leaving a slime trail. Afterwards, we go over their random trails with markers, glitter, etc… Fun! Heehee! I love it! I never, ever would have though to try this! This one is really amusing..My older was actually cheering for a while.